I am very excited and honoured to announce that I am nominated for this year’s Brickell Key Award. For those of you who don’t know the Brickell Key Award, it is the way of honouring people that have shown leadership and contributions in Lean Kanban community. Here is a list of people who won it during previous years: Jim Benson, David Joyce, Arne Roock, Russel Healy, Richard Hensley, Alisson Vale, Amanda Varella and Klaus Leopold. This year is the 5th year that the Brickell Key is awarded. 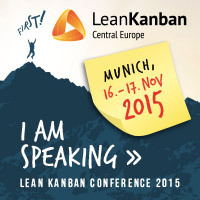 I am one of the 6 nominees because of my work on Discovery Kanban. If you like, you can support my nomination on: http://lkna15.leankanban.com/support/. Discovery Kanban systems are Kanban systems that help to balance discovery and delivery. All knowledge work requires a delicate and continuously shifting balance between delivery – exploiting existing knowledge – and discovery – exploring new knowledge. This need to balance discovery and delivery can be found across different types of activities and across different levels in the organization. Examples include developing a new product that requires novel features (discovery) while at the same time managing the overall risk that is involved in developing those features (delivery); improving agility and predictability of an organization that may require substantial change (discovery) while at the same time keeping resistance to change under control (delivery); a startup that requires an initial focus on finding problem/solution fit or product market fit (discovery) but then needs to develop the organization to delivery at scale (delivery); etc. Too much emphasis on discovery may result in a disconnection with the past leading to resistance to change, increasing delivery risk, and non-adoption of innovation. Too little emphasis on discovery (and consequently too much emphasis on delivery) may lead to not being prepared for the future resulting in stagnation and the risk of being disrupted. Discovery Kanban systems are Kanban systems that help to balance discovery and delivery while moving from a mindset of episodic (one-off) innovation and change towards a culture of continuous innovation and change. Discovery Kanban systems work across the entire discovery cycle starting from pre-hypothesis moving into hypothesis validation and ending in post-hypothesis. Patrick will discuss the different elements of Discovery Kanban, examples and underlying principles at the London Lean Kanban Day and the Lean Kanban South Europe conference.